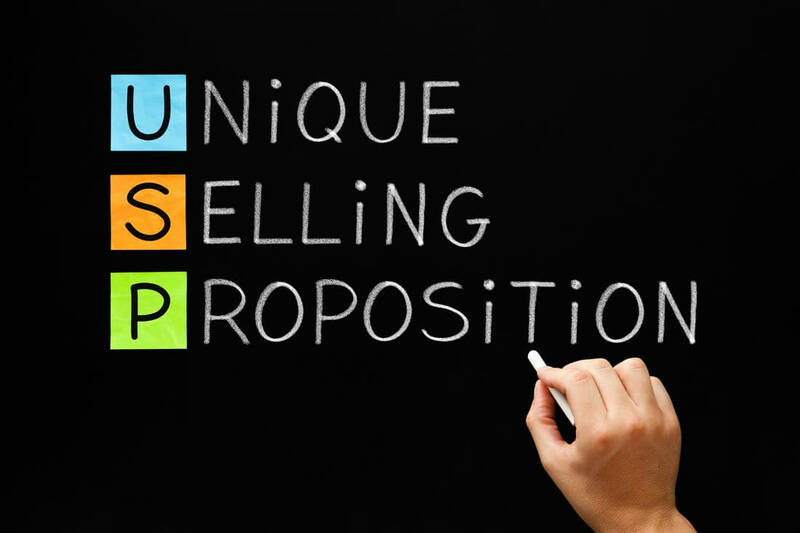 Unique selling proposition (USP) or unique selling point is defined as a unique benefit exhibited by a business, service or brand that distinguishes itself from its competitors. Typically, it’s a product or service benefit that is both unique and is meaningful to consumers. Whether it’s how the product or service is sold or consumed or if the product itself is unique though solves a common problem, the unique selling proposition should be clear and stand out from the competition. Every business experiences competition. And every day some other business is trying to take your existing customers and develop as many new customers as they can. We must all be sharper than ever in the ways that we try to obtain potential new customers. A very vital part of this process is determining and promoting your company’s unique selling proposition. This concept of the USP is vital to your communication with your existing customers as well as prospects. Determining your unique selling proposition may seem easy or obvious, but you have to examine what you think it is with a truly objective approach. Here is an exercise: write down what you think is unique about your business. Why is it different than the competition in your market and why should people come to your business over all of the other choices? Now that you have your thoughts on this, boil it down to a unique selling proposition. Something along the lines of: “At Sally’s Salon, you will not only find all of the services that you expect, but we have the best possible formula for your hair’s good health, and we offer more comprehensive styles than any other salon.” Now take a few minutes and Google your competitors. What are they saying about themselves and their services? You will probably find that your USP is not that unique at all. In fact, your competitors may be very similar in the manner in which they present themselves to the public. This should prompt you to dig deeper and to think more creatively about it. Your goal is to develop a unique selling proposition that is truly unique, and it should be easily expressible in the advertising message that you send to your potential customers. Does your business have the lowest price points for certain services? What do you offer that no other business does? If you offer the same products or services, what is different about the way you sell the items? Free home delivery? Lifetime warranty? Dig into your processes and develop that concept of uniqueness. Quite possibly the uniqueness comes from a combination of two or three things that you offer. For example, Neon You Fitness has to compete against other health clubs offering monthly rate memberships. While Neon You may offer similar benefits like a comfortable environment, classes to fit any ability, free drinks and more, they need a unique selling proposition to stand out. Instead of offering a monthly rate membership, Neon You Fitness offers pay-as-you-go pricing to simply pay as you go to the gym to workout. Additionally, it also offers pack pricing, where members can pay as they go, but by purchasing multiple classes at a time. 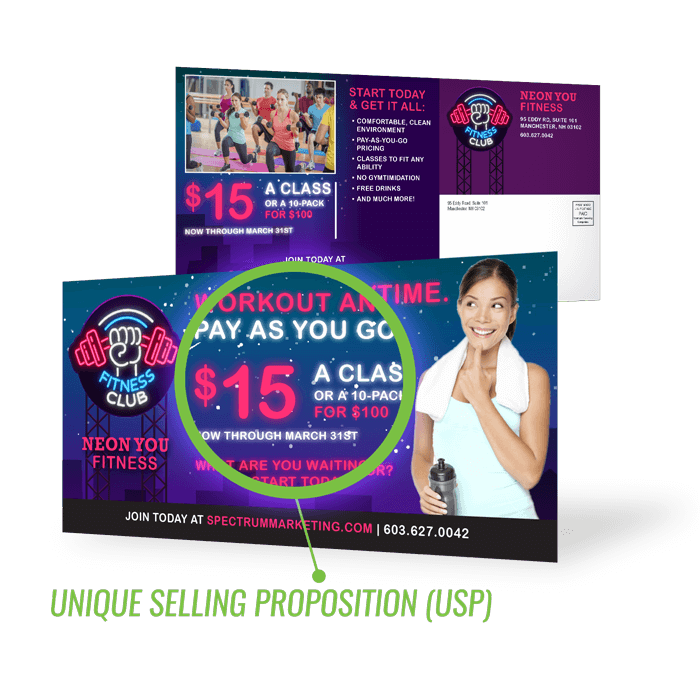 Neon You’s unique selling proposition helps them stand out in a sea of monthly rate fitness clubs. Spectrum can help you improve your USP to make it as clear and concise as possible. Then tell anyone who will listen why they should do business with you!